Starting this April, Marvel and Disney will provide you with an entire hour of cartoons jam-packed with comic-y goodness. Marvel Comics is joining forces with parent group The Walt Disney Company to create a new programming block of comic-based cartoons. The block will include the return of popular series The Avengers: Earth's Mightiest Heroes and the launch of the delayed Ultimate Spider-Man. The programming block is set to be called Marvel Universe (much like DC Nation, which was announced last year) and will air on Disney XD, starting April 1st, 2012. If you're a comic fan, I highly recommend you check out The Avengers, which can be streamed on Netflix. As the series begins, Peter Parker has been Spider-Man for just one year. He has saved lives and fought supervillains, but he is still in the process of learning how to be a superhero. Nick Fury of S.H.I.E.L.D. 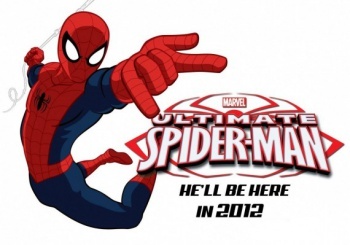 offers Peter the chance to train to be a real superhero and become "The Ultimate Spider-Man". However, beforehand Peter will have to learn how to work with a team of four fellow teenage superheroes. The voice cast for the show has some pretty big names involved, including Chi McBride (known for his work on House, Boston Legal, and Pushing Daisies), as Nick Fury, J.K. Simmons as J. Jonah Jameson, Stan Lee as Stan the Janitor, Steven Weber (from Wings and Leaving Las Vegas as Norman Osborn, and Clark Gregg (Agent Coulson in Iron Man, Iron Man 2, Thor, and The Avengers) as Agent Coulson. That's right, Agent Coulson is crossing over from movies to television, and if you don't know why that's exciting than you clearly haven't seen the short film A Funny Thing Happened On The Way To Thor's Hammer.